48Upper is the first Social Collaborative IT Management solution to fully embrace social networking and the power of the community directly within the processes that run IT. 48Upper provides IT professionals with the tools and knowledge necessary to be more productive by solving problems and finding solutions more efficiently than ever before, and most importantly, without ever having to leave what they are working on. 48Upper is a powerful on-demand service designed for simplicity and ease of use. It addresses the processes of running IT, where the collective knowledge and power of the community is available to all and is built directly into the service. The combination of function and fun will transform the way IT Professionals work, connect, share, and ultimately, succeed. 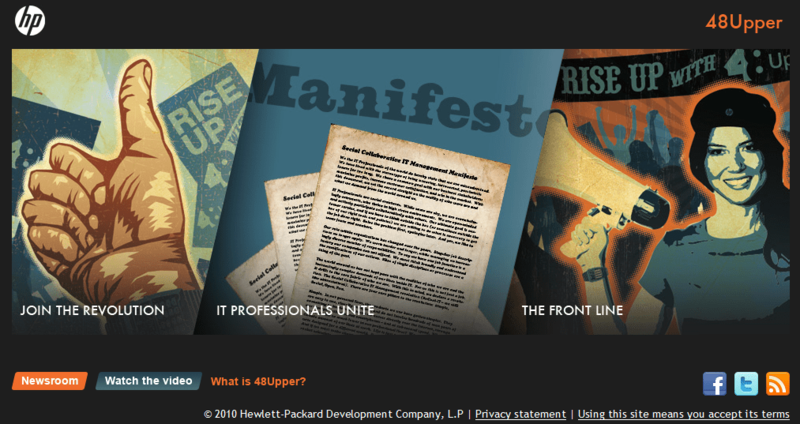 48Upper is run by HP and a hope to utilize social networking for the next generation of IT. By building up a community, IT professionals might be able to share knowledge and solve problems more effectively. Their video tells the rest of the story about how the no-longer antisocial IT will become happy and cheery with social networking. That’s about all I can say about the site because there isn’t much else up there and not a whole lot of networking going on at the moment. You can view their manifesto, read The Front Line blog, or catch up on some of the 48Upper and HP related news. That’s about it for now but it’ll be something to keep your eyes on if you’re an IT Professional to see what can come of this. Check out the 48Upper site.